Where do I use my Gardens and Homes Direct voucher code? Gardens and Homes Direct have a plethora of garden products including furniture, storage, structures, tools, accessories, bird care and plant and lawn care. Discover everything you could possibly need for your garden including benches, hammocks, tables and chairs, patio sets, gazebos, log cabins, garden sheds, trowels, rakes, lighting, barbecues, patio heaters, pots and planters and much more. As well as a huge array of garden products, Gardens and Homes Direct have a huge variety of homeware including decor, furniture and accessories. All these products are made in a selection of materials like wood, glass, rattan, aluminium, and steel and come with affordable price tags and even discounts. At Gardens and Homes Direct you can also find a plethora of gifts including gifts for gardeners, gifts for chefs, experience days and much more. You can also shop in the clearance section for homeware, garden products and gifts on a budget, all of which are heavily discounted, allowing you to fill your home with top quality furniture and accessories for less. If you’re looking for inspiration and advice on what to buy you can always check out the blog section where there’s loads of great style tips and articles to help you furnish your home with only the very best. The Gardens and Homes Direct blog section is a great way to find inspiration and advice on home and garden products and style. Here you can find multiple articles on a variety of interesting topics when it comes to your home and garden including which houseplants are the best for your home, how to grow houseplants in your home, mess-free, how to prepare for summer, the best reasons to invest in a kid’s playhouse and much more. In the blog section you can browse through news, a get the look section, a ‘how to’ category, and an out and about section as well as a competition corner to uncover loads of great tips and money making opportunities. As well as homeware, gardening products and gifts, Gardens and Homes Direct supply an array of experience days. In partnership with Red Letter Days, Gardens and Homes Direct offer a multitude of experiences including things like tours of Wembley, chocolate tasting, horse racing for two, indoor skydiving, London meal and theatre packages, views from The Shard and wine tasting experiences. All of these experience days make great gifts for people you love and are a great way to bond and make memories with your friends and family. All these different experiences are extremely affordable and great value for money, so you can buy with confidence that you’re investing your time into something incredible that you’ll remember forever. 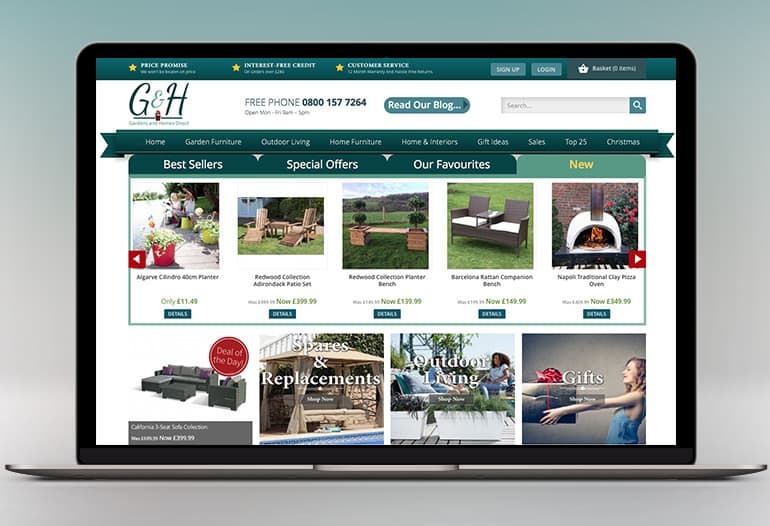 In the clearance section at Gardens and Homes Direct you can find great discounts on a variety of products including garden furniture, storage and structures, tools, accessories, plant and lawn care, bird care, homeware and gifts. With up to 60% off all these lines you are sure to find top quality products at great prices, allowing you to fill your home and garden with all sorts of great items without spending a fortune. If you pair your clearance items with a discount code from us too, you could save even more money on your order. All the products in the clearance section are updated regularly so make sure you check back every so often to find new items with huge price reductions. Gardens and Homes Direct will process your refund within 14 days of the goods being received back to them, or within 14 days of being notified that the goods have been sent back. If they do not require the goods back, they will process your refund within 14 days of the refund being agreed. Or use the live chat feature on their website. At Gardens and Homes Direct you can find a variety of top quality products for your home and garden, all of which is extremely affordable. Shop for garden furniture, structures and storage, garden tools and accessories, bird care, plant and lawn care, homeware, gifts and a handy clearance section. Buy online with a Gardens and Homes Direct voucher code from us and save money on your purchases too. With so many great products to choose from, you can keep your home and garden kitted out all year long, for less than you bargained for. And with interest free credit available on selected orders you can now spread the cost of your order too.